This has until now been a fruitless search – primarily because of 3 and 4, and I’ve ended up using Awesome Note. The ticks above indicate what Awesome Note supports. Awesome Note is indeed awesome – especially after they’ve fixed the Google sync issues that plagued them for a some time. 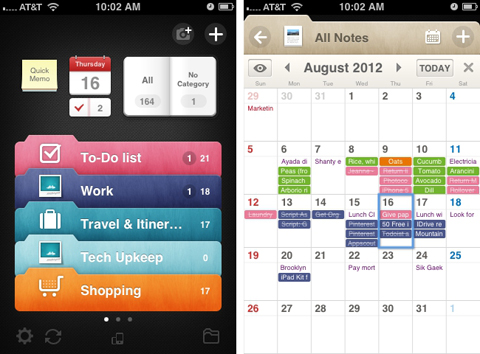 The additional diary and calendar features are particularly cool. Still, of the 6 points, 3 and 4 are not ticked of – which is a big deal for me, meaning that I’ve only used Awesome Note for notes and not made use of the nice todo and calendar integration features. If you want to try this out yourself, here’s my setup: python-2.6.2, gdata-2.0.14 and strongly modified versions of gcp.py, gls.py, gmkdir.py and gmv.py from gdatacopier-2.1.2. BTW: this is Linux only. Now just run tdo.py and lean back while your Todo notes are being organized in folders. Obviously, use this software at your own risk – and have fun. This entry was posted in Hacking on January 25, 2013 by frederik. I also need that heirachy. I also need to be able to collaborate with others (sharing tasks, or one person assigned the task but being able to look at their list – all controlled by settings of course). Someone recently told me about awesome notes, in researching I found your post. I use toodledo – it does what you want (I am not sure about the google drive but I don’t need that because I can access it via the web page and my smartphone, it does interact with Google calendars which i don’t use so it may interact with google drive). It does folders, then tasks, and then subtasks under the tasks for heirarchy, I wish it had another layer down but I can live with this amount of layers. And you can set context, tags, goals, and other things to further break things down. It is very flexible. If you decide to check it out, I would love to have your opinion on how it compares to awesome notes or anything else you have liked. Thanks for your reply. I’ve tried out toodledo, but that was more than a year ago and I don’t have any detailed recollection other than a generally positive impression and, well, its non-honoring of my demands 2 and 4 above. I do realize that these two demands are a bit special and probably not a big deal for most people, so don’t take this as any criticism of toddledo – I’m sure it’s a great product.